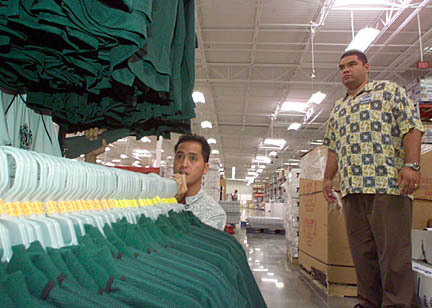 John Cruz, general manager of the new Sam's Club store on Keeaumoku Street, secured a display of University of Hawaii shirts of Friday while colleague Rodney Arias looked on. Arias was promoted to manager of Wal-Mart's Pearl City store after Cruz took his new job. roles at Wal-Mart Stores Inc.
As a boy, Rodney Arias Jr., the son of well-known Hawaii-singer Rodney Arias, dreamed of singing at the Waikiki Shell. But to pay the bills he got a job as a grocery store meat wrapper. These days, Arias is singing Wal-Mart's praises. The opening of the Wal-Mart and Sam's Club on Keeaumoku has given the 1990 Kamehemaha graduate the opportunity to test his management skills. Arias, 32, was promoted to general manager of the Pearl City Sam's Club after his friend and mentor John Cruz left that post to open the new 450-employee store on Keeaumoku Street. Cruz, an immigrant from the Philippines before getting his start with Wal-Mart Stores Inc., mentored Arias until he was ready to rise in rank. Cruz, in turn, will head up the company's highest-profile store opening in years. The double-decker 315,000-square-foot-structure, which features a Wal-Mart store on the bottom with a Sam's Club on the top will take up 8.5 acres of a 10.5-acre property bordered by Keeaumoku, Rycroft, Sheridan and Makaloa streets. 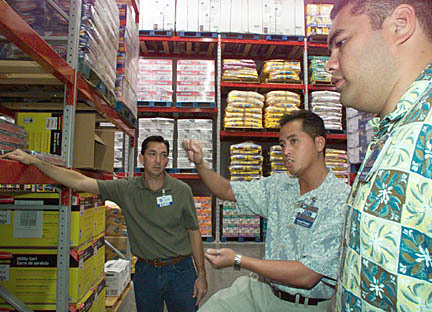 John Cruz, center, the general manager of the new Sam's Club on Keeaumoku Street, discussed shelving with store employee Randy Orozco, left, and Rodney Arias, general manager of the Pearl City Sam's club. A grand opening is set for 9 a.m. Wednesday for Wal-Mart and 10 a.m. Oct. 21 for Sam's Club. Just like all the other Wal-Mart endeavors in Hawaii, the majority of associates and managers at the property will be kamaaina, said Cynthia Lin, spokeswoman for Wal-Mart. About 60 percent of Wal-Mart's management team in Hawaii are Hawaii residents and the majority of the team were promoted from within the company, Lin said. "Wal-Mart is committed to promoting from within and what we have seen is that over the years so many of our managers have grown with the company," she said. The Bentonville, Ark.-based company employs about 4,500 associates at its seven Wal-Mart stores and two Sam's Clubs in Hawaii, Lin said. Fourteen of the 19 managers at the Keeaumoku Wal-Mart are kamaaina as are nine of 17 managers at adjoining Sam's Club, she said. "We believe in promoting from within here in Hawaii because kamaaina understand the culture and the market better," said Walter Lott, store manager for the Wal-Mart. In addition, Wal-Mart likes to promote from the ground up, Lin said, adding that more than 70 percent of Wal-Mart and Sam's Club managers in Hawaii started as hourly workers pushing carts, stocking shelves and serving as cashiers. "I thought my goal was to be a meat cutter," Arias said. "I never imagined that I'd be a general manger of a store with 360 associates." But Cruz, who got his start pushing carts part time for Price Club before joining Wal-Mart, said he's proof the company stocks big dreams, too. "Part of me is still the little Filipino kid who came to the United States when I was 11," Cruz said. "I spoke broken English and I was shy, but I'm proof that you don't have to be the smartest guy to succeed, you just need to persevere." As Cruz encouraged Arias and trained him to ascend to general manager, a friendship developed between the two men. "I was always following him around asking him questions, learning from him," Arias said. While Arias relied on Cruz to teach him business and management skills, Cruz relied on Arias to teach him local style. Yesterday at the Keeaumoku store, Arias was once again walking beside Cruz as the two geared up to open the new store. But their relationship has evolved beyond mentor and associate, this time it Cruz was asking the questions and it was a fellow general manager who replied. >> The opening of the Wal-Mart and Sam's Club on Keeaumoku will employ more than 1,250. >> Fourteen of the 19 managers at Wal-Mart are kamaaina hires as are nine out of 17 managers at Sam's Club. >> About 60 percent of Wal-Mart's management team in Hawaii are kamaaina and the majority of the team were promoted from within. >> More than 70 percent of Wal-Mart and Sam's Club managers in Hawaii started as hourly workers pushing carts, stocking shelves and serving as cashiers.